Biomolecular Computer: The Tiniest Doc? A biomolecular computer diagnoses in vitro a form of cancer - and then performs an appropriate medical intervention by producing a biologically active molecule with anti-cancer activity. The input, output and software are made up of DNA molecules. 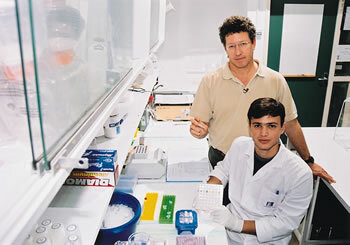 Dr. Ehud Shapiro, of the Weizmann Institute, states "Our work represents the first actual proof of concept and the first actual demonstration of a possible real-life application for this kind of computer." Our work demonstrates a robust and flexible molecular computer capable of logical analysis of mRNA disease indicators in vitro and the controlled administration of biologically active ssDNA molecules, including drugs. The modularity of the design facilitates improving each computer component independently. For example, computer regulation by other biological molecules such as proteins, the output of other biologically active molecules such as RNA interference, and in vivo operation can all be explored simultaneously and independently. Each molecular computer acts on its own, and performs just one diagnosis and drug administration task. A system of biomolecular computers could perform a set of tasks in parallel without interfering with each other. How big are they? About one trillion biomolecular computers can fit into a drop of fluid. These little DNA-based computers are the first generation of biological problem-solving computers. To see what biomolecular computers are like when they become intelligent, see the intellectual cells from Greg Bear's classic 1984 novel Blood Music. See the original story here and Tiny computer could fight cancer.